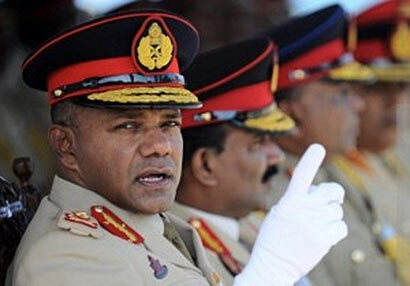 Addressing the Sri Lanka Light Infantry (SLLI) troops, Army Commander Daya Ratnayake has warned he would not tolerate any behavior that goes beyond their legitimate duties. The Commander also underlined the importance of maintaining strict discipline all time. Lt. Gen Ratnayake made this comment when he visited the SLLI Regimental Headquarters, Panagoda on Friday. If this officer had any sense of patriotism or reponsibility, he would have resigned his post following the horrific crimes against innocent Sinhala Buddhist citizens caused by a rampant Army on the first day of his new job. He is talking about strict discipline and behaviour that goes beyond legitimate duties. This officer should find out who gave instructions to the Army to open fire on innocent civilians. He should stop blaming the soldiers on the ground as they were carrying out orders from above and behaving within legitimate duties. pippuh, If this officer has “resigned” straightaway as you suggested, then how could he investigate “who gave instructions to the Army to open fire”, again as you suggested? Your two suggestions are contrary to each other ! Knee-jerk reactions to an incident are thing of the past!